When I started the Bovine Ska and Rocksteady back in 1996, a show that has always focused on early Jamaican music, I knew that there would be a time when a lot of the artists that I had loved from that period would begin to pass away but I would never have imagined the occurrences that have happened these last few months. Hopeton Lewis, Jackie Bernard, Tito Simon and now, arguably the most celebrated of that group, Sir John Holt, has passed away at the age of 69 in London. There had been rumors of his passing since Holt had collapsed at the One Love Festival in England not too long ago but now the rumors are confirmed true. This past week, we dedicated the entire show to John Holt, from his earliest recordings with Leslie Kong at Beverley’s, through his time as the lead singer of the hugely successful vocal group, The Paragons, and finally as an even more popular solo artist. You will hear one of the finest voices to have ever recorded in Jamaica. John Holt was born in Greenwich Farm, Kingston on July 11th, 1947. At the young age of 12, Holt entered the music industry with performances at talent shows. 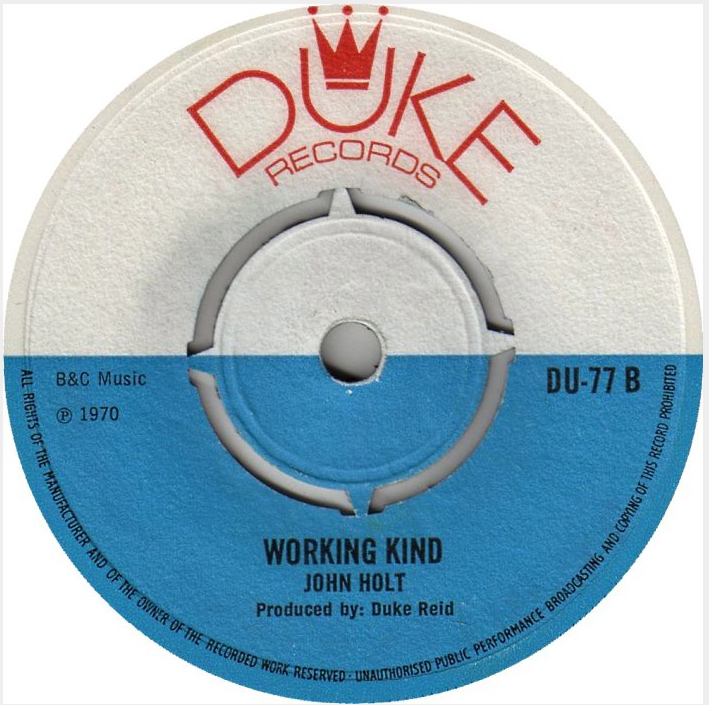 Like so many of his peers, Holt would perform in these shows and would also eventually make multiple appearances on the (like Veer Left) Vere John’s Opportunity Knocks Talent Show. During these early competition years, Holt won a total of 28 awards. As Holt gained fame from the shows, he attracted the attention of Lesley Kong and recorded his first single for the Beverley’s label in 1962. His first recorded single is what we started off with during this John Holt memorial show. 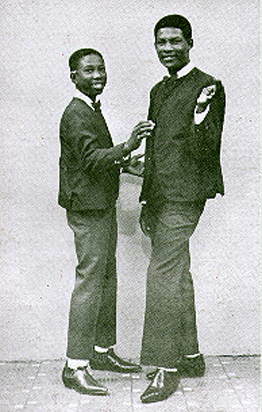 Given the popularity of vocal groups and duos in the early 1960s in Jamaica, a very young Holt teamed up with Alton Ellis to record a duet in 1964, for Vincent Randy Chin called “Rum Bumpers,” a fun ska number about bootlegging. That same year John Holt would join what would soon become one of the most popular vocals groups in Jamaican history, The Paragons. However, he was not initially involved when the group was conceptualized at the back of the Kingston Parish Church, by Keith Anderson, better known as Bob Andy, and Tyrone Evans in the very early 1960s. Andy and Evans were members of the church and started singing as a duo on the church compound. Bob Andy, in an interview from 2013, explained the group’s beginnings. “There were lots of duos in the market at the time: The Blue Busters, Keith and Enid, Higgs and Wilson, Alton and Eddy, to name a few. Tyrone felt that was kind of a strong field, so we started listening to groups with more than two, like The Drifters, The Four Tops, and The Temptations. While we rehearsed and played the piano, lots of people would join in. We tried many, until we settled with Evans, Howard Barrett and myself. Then someone told us about John, who was on his way to becoming a solo artiste after winning on Vere Johns, and so we got him into the group. He fit perfectly and we continued as four until I left, and they decided they’d remain a trio,” he said. Andy went further, explaining that at one point the group swelled to five, with the inclusion of Junior Menz, a future lead vocalist of the Techniques and the name Pentagon was contemplated, but when Menz left, they settled with the name, Paragons. The Paragons version with Holt first cut tracks for Coxone’s Supreme label, and we played those songs first. After recording for Coxone, the Paragons traveled over to his rival, Duke Reid and cut more tracks for Treasure Isle and would see their greatest fame as a trio. In 1967, at the peak of rocksteady, The Paragons would record a few tracks for Winston Blake’s Merritone Label. Though the Paragons officially split up in 1970 with the immigration of Tyrone Evans and Howard Barrett to America, Holt had been recording singles as a solo artist throughout the late 60s at the Paragons main label, Treasure Isle but also for his old producer, Coxsone Dodd, and young producer Bunny Lee. We’ll hear those singles next. Holt’s popularity continued to grow in both Jamaica and in England and the demand for full length releases of his solo work grew rapidly. His first full length would come courtesy of Coxsone and the superb 1970 LP, A Love I Can Feel. He would record his subsequent LP with Coxsone, for UK release, with it’s hit title cut, OK Fred. A follow-up record simply entitled “Holt,” produced by Bunny Lee and released on Jaguar would also prove hugely popular in England with the hit version of “Stick By Me.” Holt would also contribute vocals to a couple of brilliant songs on the seminal Prince Buster produced release featuring a young DJ named Big Youth, entitled “Chi Chi Run” in 1972. He would then work with Harry Mudie on the lavishly produced 1972 classic, “Time Is The Master.” Giving Holt’s vocals that string accompaniment that would become the trademark of many of his recordings, specifically aimed at the UK audiences. Putting this show together reminded us as to how great his voice was. John Holt will truly be missed. R.I.P. John. Bovine Ska and Rocksteady: 10/15/14 Generoso’s Birthday Show and 1968! Besides being the year of Generoso’s birth, 1968 was one hell of a year for Jamaican music. That year saw the end of the rocksteady era and the rise of a new rhythm in Jamaica…reggae. As the tradition goes during the last eighteen years of the Bovine Ska and Rocksteady, Generoso’s birthday radio program is punctuated by having good friends stop by the station, the making of a cake with one slightly disturbing word as it’s message for the year, and the playing of tracks from 1968, both rocksteady and reggae of course. The show begins this year with eight tracks that actually feature the year “1968” in their title, many of which were Jamaican song competition entries for that year like “Intensified ’68” by the late, great Desmond Dekker which begins this year’s show followed by the version from Lynn Taitt and The Jets going out as always to Magnus. 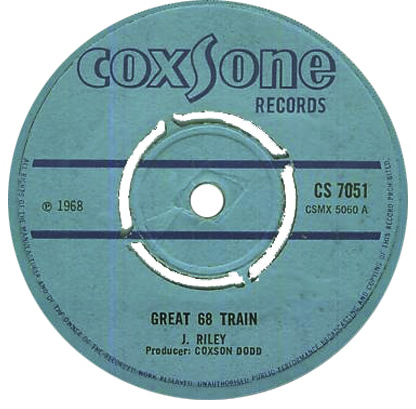 The Three Tops punchy rhythm on “Great ’68 Train” produced by Coxsone followed and a smart reggae from producer/vocalist Clancy Eccles “Festival ‘68” ended that opening set. Of the 1968 titled tracks we played, we must say that “Come Down 68” featuring the smooth voice of Trinidadian, Kentrick Patrick, a.k.a. Lord Creator is my favorite. We so wished that Creator had cut more tracks during early reggae as his voice was made for the rhythm and the track does remind me of his masterpiece, “Such Is Life,” which he cut for Randy’s. This year, we called out to the listeners for their favorite 1968 tracks and our good friend Melody Wining suggested the track that many people regard as the very first reggae release… “Do The Reggay,” a Beverley’s produced cut that does possess that irresistible early reggae rhythm that we love here on the show, and a lead vocal from Toots which is as always as raw and brilliant as you could ever hope for in a cut. Finally, we want to wish love to you our Brian, Nancy, and Brett who came to the station that night to help us celebrate and to all of our listeners and friends who called or emailed good wishes throughout the day and the show. The history behind the Clarendonians is a bit unclear and conflicting. We know for a fact that Fitzroy Ernest Wilson and Peter Austin were the two founding members of the group. Both grew up in Hayes, Clarendon and formed the duo in 1963 when Austin was 18 and Wilson was only 12. After performing in local talent shows, the Clarendonians caught the eyes of the music industry and recorded first for Leslie Kong in 1963 with their single, “A Day Will Come.” As Austin and Wilson continued to perform, they caught the attention of Coxone Dodd and began recording for his Studio One And after this point, things get very confusing, but before we dive into the cloudy history of the Clarendonians line up, we’ll first hear “A Day Will Come,” their first single and then their early cuts for Studio One. We know that Freddie McGregor joined the Clarendonians at the age of seven, and it is believed that Coxone Dodd was the one who suggested that Freddie should be the member to expand the Clarendonians into a trio. While the Clarendonians recorded as a trio, the members of the group also recorded in duets with each other. McGregor recorded with Wilson as the duo Freddie and Fitzie, and Austin also recorded with McGregor as Freddie and Peter. And even though the duet recordings did not include all three members of the Clarendonians, the recordings of the duets were often branded with the Clarendonians name. And to make matters much more confusing, each member of the Clarendonians recorded solo tracks that were occasionally pressed with the Clarendonians name as well. Despite all of the confusion and mystery surrounding who exactly is on each recording that claims to be that of the Clarendonians, we do know that there are three core members, and as a trio they predominantly recorded for Studio One. Austin became disaffected with Dodd in the late 1960s and went on to record as a solo artist for producer Ken Lack and Phil Pratt, but eventually left the music industry and went on to work as an aviation supervisor at Norman Manley International Airport. Of the Clarendonians, Ernest Wilson was the first member to establish himself as a solo artist. McGregor took more time to establish himself as a solo artist, working at Studio One as a session drummer and backing singer, and eventually found success with “Bobby Bobylon”, and of the trio, had one of the most successful careers. On “The Best of the Clarendonians” record pressed by Studio One, there are only pictures of Austin and Wilson (as seen above). In addition, there is written introduction and description completed by Vin Dunning which does not mention Freddie McGregor in any way. On October 8th, 2014, we did our spotlight on The Clarendonians from the earliest recordings during the ska era only. We hope you enjoy it! This link will be active until 10/21/2014. A joyous week at the Bovine Ska and Rocksteady as we celebrated our first wedding anniversary as married peoples 🙂 Thus we began with two sets of killer Jamaican ska and a mento set of questionable virtues! We also did as our spotlight, one that has never been done on this show, that of Bop and the Beltones! Bop and The Beltones were originally Rudolph Simmonds (who was known as Bop the dancer), Keith Mitchell, and Owen Laing who first recorded with Coxsone at Studio One and were under contract with him for some time in their early career. Trevor Shields was a young musician who would practice with his guitar and sing at school when he would one day run into The Beltones who invited him to ‘jam’ with them. This was a strange time for the group because they were frustrated with the lack of progress coming from Studio One, and at the same time Bop left the group in order to pursue a dancing career in the U.S. 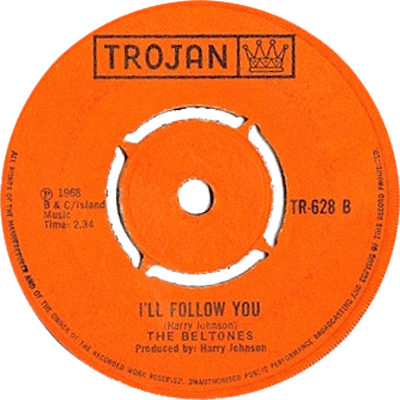 In a moment of fate, Keble Drummond introduced the Beltones to Harry J, who at the time was only an insurance salesman looking to enter the music industry. Harry J heard the group and wanted the Beltones to be a part of his emerging label, and the group accepted. After hearing the group rehearse No More Heartaches, a track written by the newly appointed Beltone, Trevor Shields, Harry J actually rearranged the harmonies in the group, making Trevor the Lead instead of Keith, who was the original lead for the track. After the rearrangement, the group recorded No More Heartaches with Harry J as the producer, but given that Harry did not have a studio yet, the single was actually physically recorded at the studio of Studio One. After No More Heartaches got the Beltones some popularity in Jamaica, the group performed at the Carib theater, toured the North Coast, and appeared on both TV at JBC and radio at RJR. Their recordings ended up doing well in England because they were distributed by Trojan, but the band did not see a ton of success, and eventually, they called it quits, with Owen moving to Canada and Keith moving to the U.S. Trevor would continue recording as a solo artist and with other groups. On October 1st, 2014, we did our spotlight on Bop and the Beltones from the earliest recordings during the rocksteady era with Studio One through their time with Harry J. This link will be active until 10/14/2014.